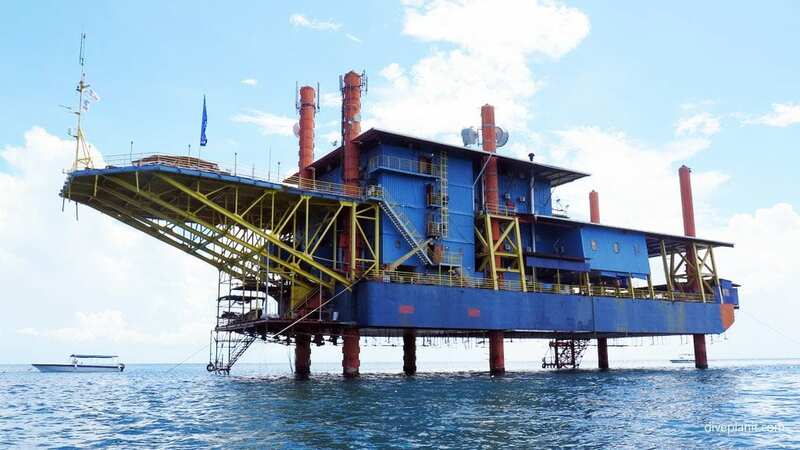 Seaventures Dive Rig was built as a jack-up accommodation module to support oil exploration in various locations until 1985 when it was decommissioned. An ex-chief minister discovered the giant metal structure and the potential to upcycle it into a hotel rather than downcycle to scrap metal. 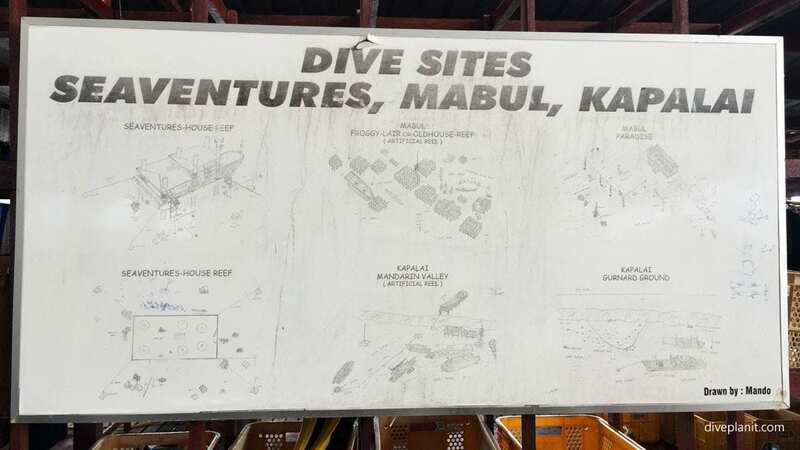 It was decided to relocate the rig to Mabul, close to Sipadan with the sole intention of providing divers with a base for one of the best dive sites in the world. 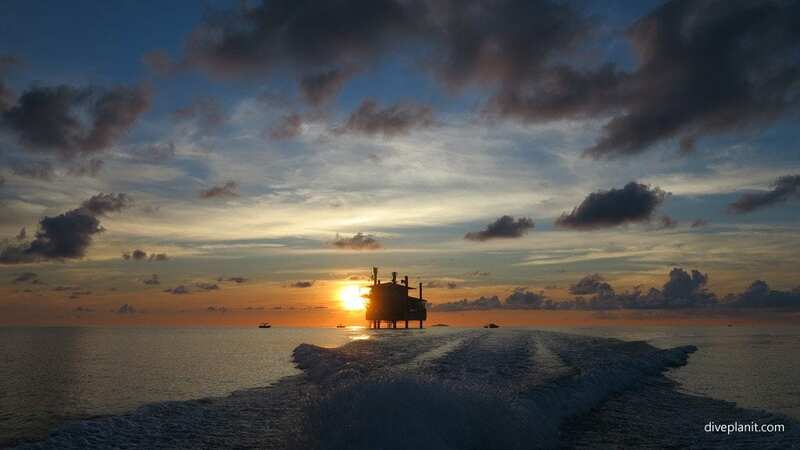 The rig has been at its current location since 1997, where the structures and shelter have created a haven for fish – making it what it is today: a fully self-contained dive resort with equipment, boats and accommodation. 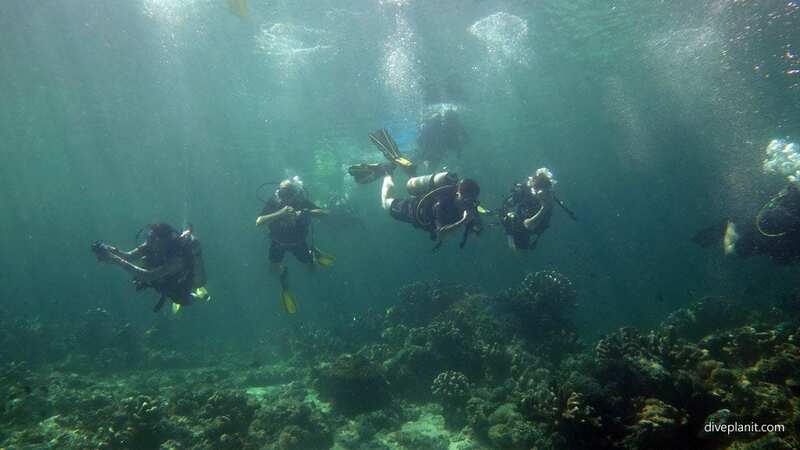 Like most dive resorts, it is surrounded by the ocean, which is not accessed via a jetty or the beach, but rather an external lift platform which takes about six divers fully kitted divers each trip. The lift – that provides ready access to the ocean – is metres from dive deck and the adjacent area is the restaurant and bar. On arrival you will be given the tour around the dive deck; though it’s all pretty straightforward: tanks are set up for you with BCD and regs attached. You have a basket for your basics and weights. There are labelled wash down tubs and plenty of hanging space, and even an air hose to blow dry camera gear. So when you’re ready to kit up everything is within 12 m² and 10 m from the all-important lift. It is a perfect spot for training – no need for a commute in a dive boat, no long shore walks – just brief on the deck and kit up to dive. 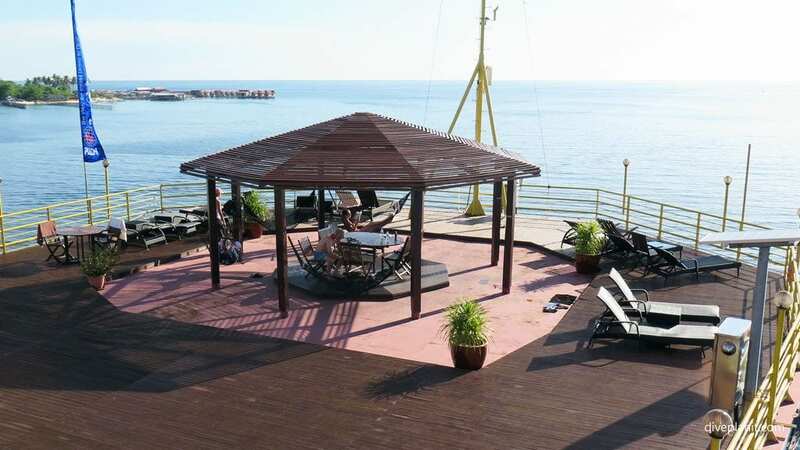 Then your tour will continue to the bar and restaurant ‘day-area’, and include the recreation room, the sundeck and finally your accommodation. The rooms are air-conditioned, compact, clean and functional. Our double had an en-suite bathroom with electric shower; a small low table which functioned as our charging station, and a high narrow table which functioned as our drying and assembly table for the cameras. 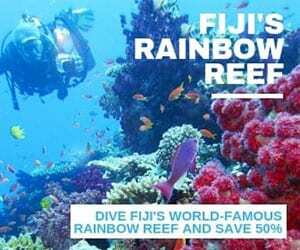 Pricing includes accommodation as specified, all meals, unlimited house reef diving with a buddy, tanks, weights, boat, dive guide, return airport transfers, and GST. 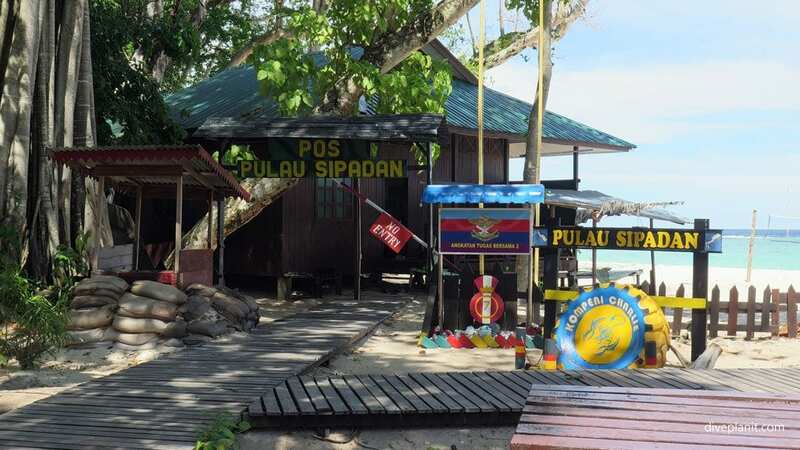 Notes: Please read the detail of the Sipadan Permit system. 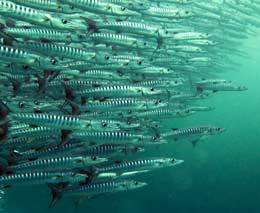 One Day of Sipadan is guaranteed for a minimum of 3 nights stay. The Permit fee (MYR 140 pp per day) is not included. Tourism Tax of MYR 10 will be charged per room per night upon check-out. All divers must dive with a dive computer. The per person pricing above is indicative only: we show 7 night with included dive packages for singles & doubles/twin-shares for the purposes of comparison. 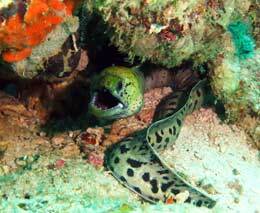 We can give you a price (and availability) for any combination of nights/dives you wish to undertake, which will include any discounts due to you as part of that package, and any exclusions, or items payable at the resort. Use the [Enquiry & Booking] button to give us your exact requirements and we'll give you the best deal we can. 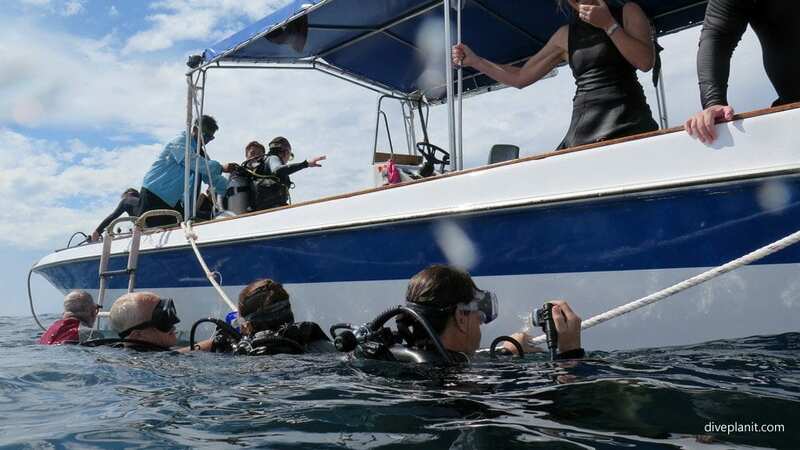 Seaventures offers up to four leisure dives a day. It is perfect for people with limited time who want to maximise their dives, with unlimited accessibility to the water at any time. 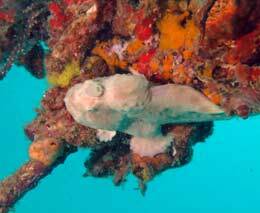 PADI courses are available from Open Water up to Divemaster. They also run periodic Instructor Development Courses. The Rig is really for the serious diver: they do not offer DSD and there is no snorkelling from the platform. PADI Tec and speciality courses can also be arranged. They have every item of dive gear for rent, and can mix nitrox on request. The schedule for each day is written up on the board, the day prior. So you’ll know where you’re going, and most importantly, which day(s) you’re going to Sipadan. When you are not out diving, the rig’s dress code is casual beachwear. Meals are served between 7 and 9am, 12 and 2pmM, and 7 and 9pm, and there is all day tea, coffee and water available in the restaurant. It’s the same breakfast that is served for people leaving for Sipadan so it’s cooked early enough for some of it to depart to Sipadan at 6am, and served, usually cold from 7am on the rig. Typically its cold beans and cold sausages, but hot eggs to order and plenty of toast and preserves. Lunch varies each day and usually includes a cold starter salad of something like green beans with a tomato and onion salsa with even a hint of chilli – very pleasant. Mains varied from fish on the bone to chicken and potatoes with crunchy greens. Dinner was as varied as a cold tuna salad starter, and ‘burger and chips’ to chicken nuggets with mixed vegetable sweet-and-sour sauce for mains. The bar serves Tiger and San Miguel the same price you’d find in town. They also have wine, but you can take your own and drink it with dinner. The supermarket around the corner from the shop in Semporna, (turn right and right again as you leave the shop) has wine if you didn’t get a chance to pick up a bottle on the way to bring some from home. 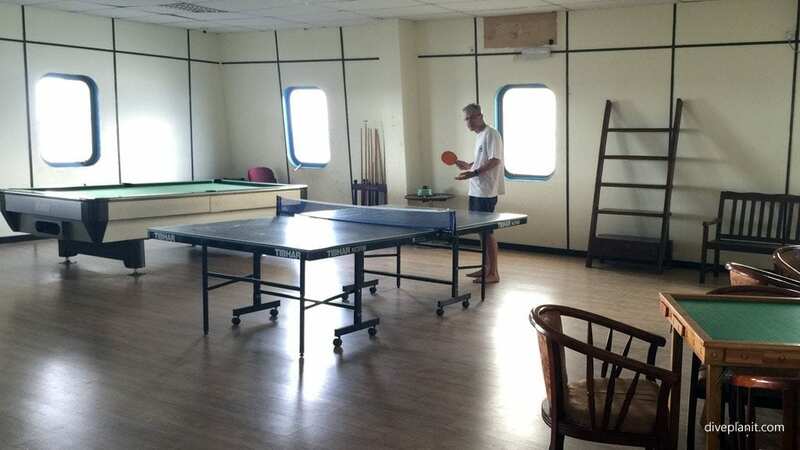 There is also quite a large games room with everything from table tennis to billiards to darts plenty of board games and a large screen TV and DVD player. One advantage of being on the rig is that there is a permanent sea breeze which makes it slightly less humid and generally more pleasant than being on the island. Also, there are no mosquitoes, and no sand flies. Over the years various bits of junk have been discarded over the edge of the platform and these now form quite an impressive artificial house reef. As well as this junk, there is also a small sunken boat and some artificial reef structures. 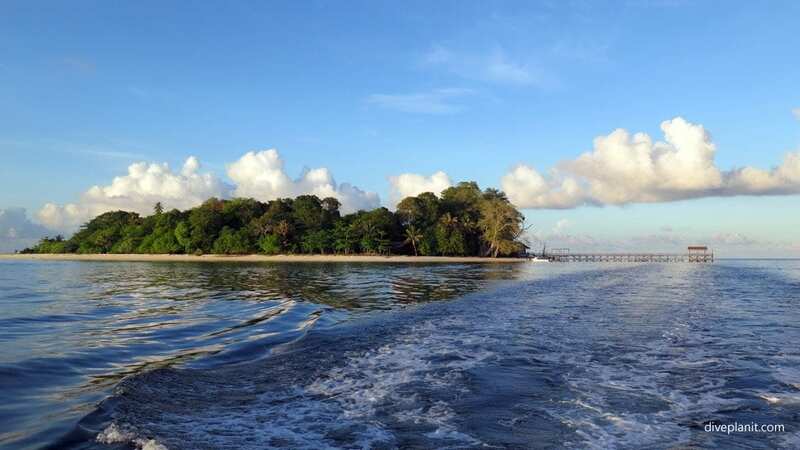 All this attracts marine life of various sizes, and the Seaventures house reef is dived not only by Seaventures guests, but also by guests from resort resorts on Mabul. A couple of hundred metres offshore from the main resorts of Mabul; transfers from Semporna are usually included in the package. 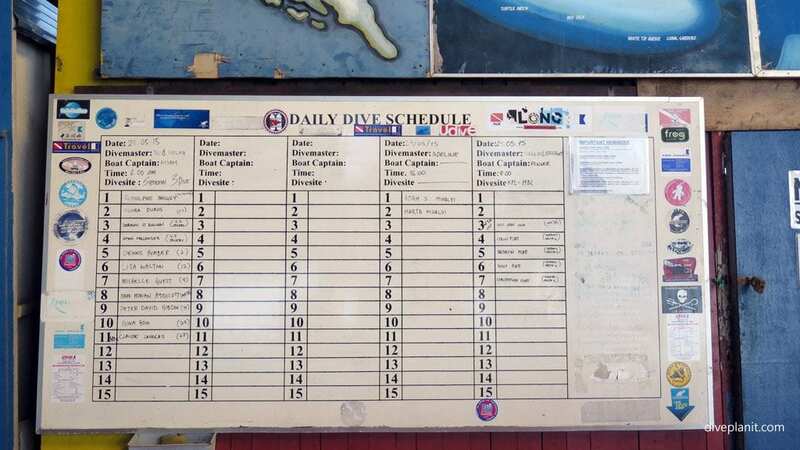 All local dives are done as singles with a return to the rig between dives. 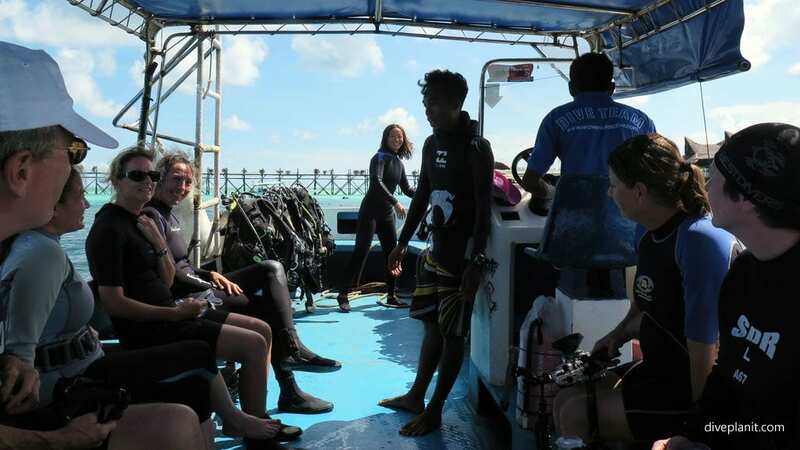 On a local dives day (as opposed to the day you go to Sipadan), you will leave for the first dive around 8am and for the second round 10 to 10:30am. The third included dive will be shortly after lunch around 1:30 to 2pm. The surface interval between the two morning dives is just long enough to grab a coffee and write up your dive log. 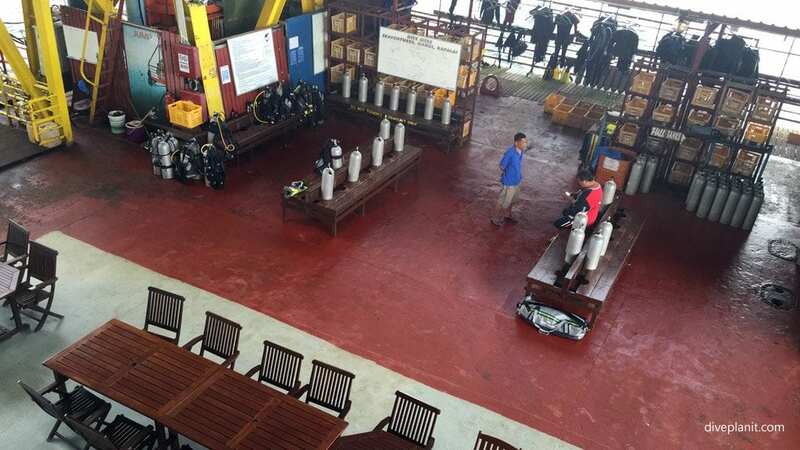 There is an assumption that if you are capable of diving Sipadan (and let’s face it that’s why you’re there) you are capable of getting yourself out of bed and assembling your own gear in a tidy and timely manner ready for each dive. Reminders and wake-up calls are not issued. Apart from wetsuit, weights and basics, you don’t really need to take a towel or water bottle out on the boat with you as you are back on the rig 10 minutes after surfacing. The boat is spacious and covered and doesn’t feel crowded even with a dozen divers on board. The tanks are upfront and so there’s plenty of space in the back to the divers. There is a net under the cover overhead to keep your hat and sunnies safely out of harm’s way. Tanks with BCD’s are passed down from the front, so all you need to do is sit into your BCD, don your mask and fins and roll backward over the side. You can either split into two distinct groups or you can stay with one guide in front and one at the back and work along in body pairs. Occasionally we’d split into two distinct groups but all arrive at the 5 m safety stop en masse. Group size is not an issue as generally good visibility and lack of current means there’s no bumping into anyone and if you’re all strung out you can travel at your own pace. On surfacing you can hand up as much gear as you like before climbing up the ladder. Most of us are fit enough just to take off fins, and walk up the short ladder fully kitted, but others do seem determined to strip down to their boardies to get back into the boat. Within minutes, we are back at the lift, and the divers go up first and head for the warm showers. The staff bring up the BCDs and regs so you can wash them off just about the time you’ve done yourself and your basics. 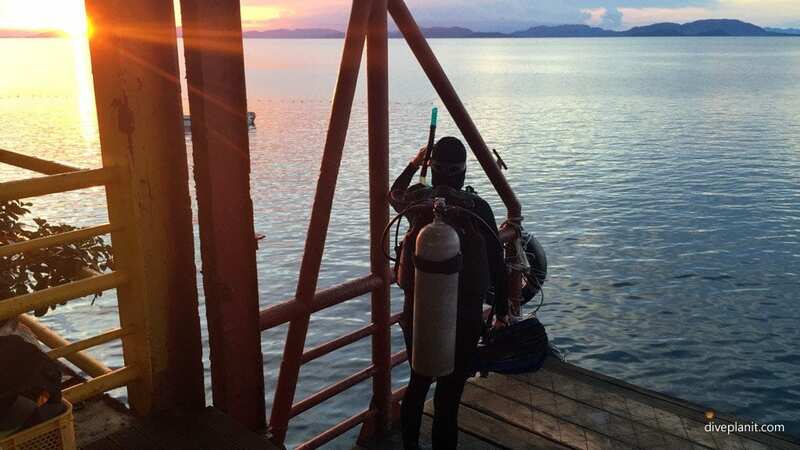 After you’ve done three dives, you might want to call it a day and head to the ‘sun deck’. 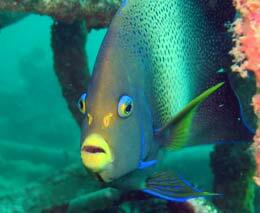 The alternative is a dive on the house reef. Not a bad way to spend an hour. Check out what you’ll see here. 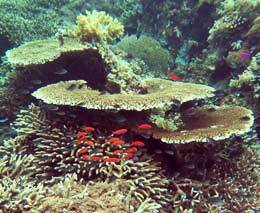 Bearing in mind people come from Mabul to dive the rig’s house reef. On the Sipadan day we’re up at 5:15am, kitting up at 5:35am, and loading at 5:55am. The Seaventures Rig has an allowance of 12 divers per day for Sipadan and on the boat there are also two guides and a boatman. The boat trip is only 25 minutes. Theoretically you sign in at the kiosk at the end of the Jetty (the island and), but often there is no-one there at 6.30am, so it’s straight off for the first dive. After the first dive breakfast is served on the island all the dive centres have their own label table undercover (from both sun and rain) and there are clean showers and toilets nearby. Breakfast is not dissimilar to that on the Rig: eggs – either omelette or hard-boiled, noodles of some description, and eggy bread or jammy bread. There’s tea, coffee and cold water to. If you wanted a soft drink or a western snack you would be wise to bring it with you. The dive times are about 6:40am, 8:40am, and 10:40am. The dives are between 45 and 55 minutes depending on how much time you spend at depth. The second surface interval is spent with fruit cake and chatting animatedly about stuff we have just seen. On surfacing after the last dive we head straight back to the Rig and arrive just 25 minutes later. There’s just time to wash down the gear before the lunch gong goes off. 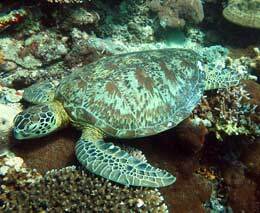 The package includes three dives in Sipadan but you can go back for a double dive there after lunch as your permit is valid for one day. Extra charges apply for this. Take a few snacks whether that’s for the early morning dive or to go with that early afternoon drink. Don’t be scared to tell the dive guides where you want to go especially if you’ve already been to a particular site once before.